Darjeeling, as well as being one of India's most popular hill stations, is surrounded by tea plantations that produce prized light colored, floral smelling tea. Around 25% of India's total tea output comes from Darjeeling. The Happy Valley Tea Estate is located just north of town and offers the only guided tea factory tour in Darjeeling. The estate grows some of the finest tea in the region and has a long history. It was established by an Englishman in 1850, later taken over by an Indian aristocrat from Kolkata, abandoned and closed in 2005, and acquired by the Ambootia Tea Group in March 2007. Guided tours are conducted from 9.30 a.m. to 4.30 p.m. daily. Elegant Glenburn Tea Estate, about an hour northeast of Darjeeling, provides an unforgettable gastronomical experience. Its Burra Bungalow was home to four generations of planters and has four guest rooms. There's another four rooms in a separate bungalow. Comprehensive packages cost about 44,000 for two people per night. Closer to Darjeeling in the Lebong Valley, Ging Tea House was built in 1864 and has been tastefully restored with six guest suites. Full-day tea experiences are offered, starting with tea in bed. Packages start from around 15,000 rupees per night for a double. Tumsong Chiabari Tea Estate, near Ghoom, belongs to the Chamong Group. The tea estate manager’s bungalow has been converted into an intimate property with four guest rooms. Bespoke packages of various lengths are offered. It's ideal for birdwatchers. On a clear day, you can see all the way to Mount Kanchenjunga. Expect to pay 12,000 rupees upwards for double, including meals. The more modern Chamong Chiabari is another property belonging to the Chamong Group. This serene property is about an hour southwest of Darjeeling town and has nine guest rooms. Rates start from 15,000 rupees per night for a double. Singtom Tea Resort, part of Darjeeling's oldest Steinthal Tea Estate, is more reasonably priced and conveniently only 20 minutes from Darjeeling town. There's 1,600 acres of private tea garden to explore! Rates start from 6,500 rupees per night. Makaibari Tea Estate, about an hour south of Darjeeling near Kurseong, offers homestay accommodations with local villagers. You can join them in tea plucking in the morning. Further south, two hours from Darjeeling and only 15 minutes from Bagdogra Airport, Nuxalbari Tea Estate is noteworthy for being the first large tea estate in India to produce "Certified Elephant Friendly Tea". It's also owned and operated by women. Tours of the estate are offered and tea is for sale. When to Go: March to November for tea plucking, but the monsoon season from June to September is best avoided. Assam, located in India's remote northeast, is the largest tea producing region in the country. Mostly grown in the Brahmaputra Valley, malty Assamese tea is brightly colored. Jorhat, in the central part of the valley, is often referred to as the "Tea Capital of the World". Stay at Banyan Grove on Gatoonga Tea Estate, near Jorhat. Built more than 100 years ago, it has colonial style and seven guest rooms. 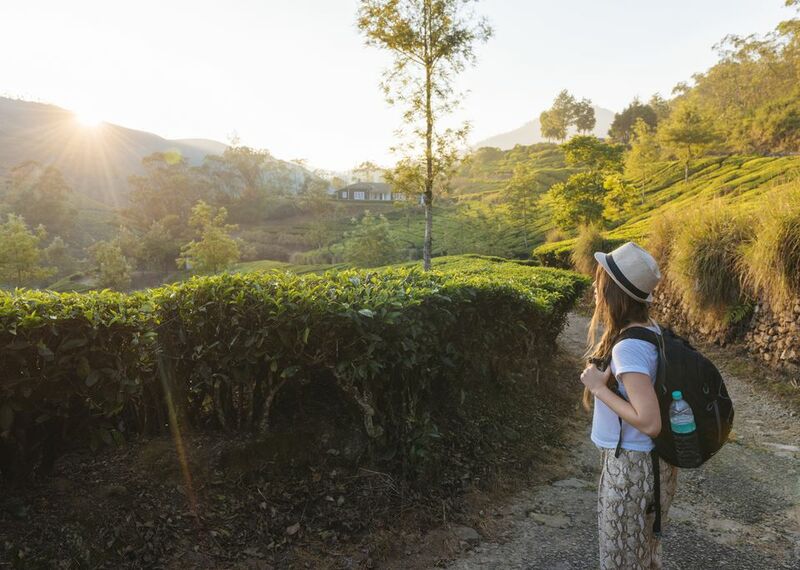 You'll be able to get a feel for what it's like to live on a tea estate, as well as visit the factory and see how tea is made. Thengal Manor heritage hotel is another option in Jorhat. Alternatively, Wild Mahseer offers newly refurbished historic tea planter bungalows on the banks of the Brahmaputra River amidst Addabarie Tea Estate, near Tezpur in Assam. Take a Tour: The Greener Pastures offers tea tours to Assam. NE Routes also conducts a comprehensive five-night tea tour with plantation stays. When to Go: Mid May to June end, for the best tea. Tea production continues until early December, but the quality of the tea steadily decreases. A Tea Festival is held in Jorhat every November. As you enter Munnar, a popular hill station in Kerala, you'll be greeted by miles upon miles of lush tea plantations. Once owned by Tata, the largest tea manufacturing company in India, they've now been sold to employees. Head to India's first Tea Museum at Nallathanni Estate to take a fascinating look at the history of tea production in Munnar. It's open daily, except Mondays, from 10 a.m. to 5 p.m. The cost is 125 rupees for adults. The Tea Harvester is a peaceful new boutique resort surrounded by tea plantations. Dream Catcher Plantation Resort (with four stunning tree houses nestled into the tea plantations) and Gruenberg Tea Plantation Haus are also recommended. If staying on a tea plantation isn't a must for you, Windermere Estate offers an exceptional experience. This outstanding heritage properly consists of an original Planters Bungalow and 18 additional cottages on a cardamom plantation. It also has its own private lookout, atop a gigantic boulder. When to Go: The tourist season is from August to May, although winters are very cold during December and January. Just across the border from Kerala, at 8,000 feet above sea level, Kolukkumalai Tea Estate is perhaps the highest tea plantation in the world. The tea grown there is known to have a unique aroma and taste because of the high altitude. Although it's located only about 32 kilometers (20 miles) from Munnar town, it takes around 2 hours to reach this isolated destination via Suryanelli in Kerala's Idukki district due to the rugged terrain. The final part of the journey can only be undertaken by jeep. It's a Teapicturesque drive though. The tea estate was founded by the British in the early 1900s, and its factory still uses the original orthodox method of tea processing. It's possible to visit it on a day trip. However, for the best experience, stay at least one night on the property in the guesthouse or mountain hut. The mountainous Nilgiri district of Tamil Nadu, in south India, is known for its distinctive dark and intensely aromatic tea. Tea has been grown there for more than 100 years, and is the most important industry in the region. Coonoor is the best place to discover Nilgiri tea, as that's where it was initially growing in the 19th century. Start at the Highfield Tea Factory, near Sim's Park (or if you wish, Homedale is a much quieter option). Participate in one of the gourmet tea tasting experiences conducted by local tea industry pioneer, Tranqulitea, on their tea estate. You'll get to sample a wide range of teas and learn how they're made. Plantation tours and accommodations in plantation bungalows are also offered. Otherwise, stay in Coonoor at the delightful Tea Nest on Singara Tea Estate. Go there on the renowned Nilgiri Mountain Railway toy train. If you really want to get away from it all, O'land Plantation Stay is recommended. It's about 45 minutes south of Coonoor. Take a Tour: Breakaway offers this Blue Mountains and High Tea trip from Coimbatore to Coonoor and back. Your host, a tea planter, will share his knowledge with you. You'll also get to visit a farm stay that makes cheese. When to Go: Tea is produced throughout the year in Nilgiri. However, the best teas are produced during the cooler winter months (late November to mid-February). Wayanad, a lush mountainous agricultural area of Kerala, also produces a significant amount of tea (in addition to coffee and spices). Most of the tea plantations are located south of Kalpetta, in Vythiti and Meppadi. The road to Chembra Peak will take you through a private estate, which is worth a look. Parisons Plantation Experiences is a serene property that has two luxuriously remodeled bungalows with a total of 10 bedrooms. It's situated on a 4,025-acre tea estate with a 200-year-old history. Activities include tea tours, visits to tea factories, trekking on various tea trails, and afternoons at the Planters Club. Tea Terrace has attractive cottages set amid a tea plantation in Vythiri. Tea Route Homestay is popular at Meppadi. Wayanad Tea Drops has a two bedroom cottage on sprawling Chellotte Tea Estate in Chundale. It's ideal for families and friends. Priyadarshini Tea Environs (Mananthavady Tribal Plantation Corporative Society) is a community tourism initiative. The estate has a tea factory, tea museum, accommodations, and activities for tourists. When to Go: September through to April, to avoid the monsoon rain. Tea was introduced to Palampur, about an hour from Dharamsala in the Kangra Valley of Himachal Pradesh, in the mid 19th century by the Superintendent of Botanical Gardens in Peshawar, Doctor Jameson. Palampur Cooperative Tea Factory welcomes visitors and offers factory tours. Wah Tea Estate is the northeast working tea estate in the Kangra Valley. It's been in business since 1857 and survived the earthquake in 1905, which seriously disrupted tea cultivation in the area. The tea produced there is organic and 100% pesticide free. Stay at The Lodge at Wah, a new eco-friendly boutique homestay on the property. It has eight rooms in three gorgeous, rustic cottages. Tea plantation and factory tours, and tea tastings are provided to guests. Other recommended options on tea estates in Palampur are Country Cottage Tea Garden Resort and Norwood Green. When to Go: March to June and mid-September to November, for the best weather. Tea is plucked between April and October.